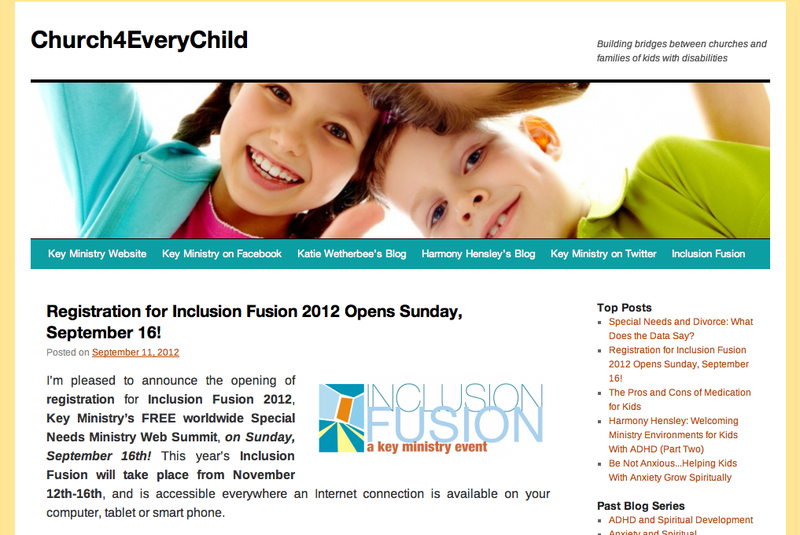 ← Registration for Inclusion Fusion 2012 Opens Sunday, September 16! 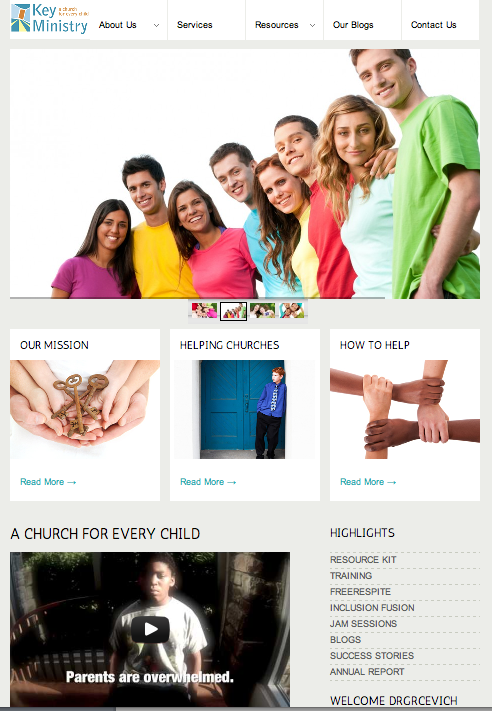 We did a few things last week to tidy up the appearance of the blog…design changes to blend the appearance of Church4EveryChild into the look we used for the new Key Ministry website. Below the “Top Posts” section in the right hand sidebar, readers can now access either links to, or the complete text of all of our earlier blog series. Of greatest significance to readers are the updates to our “Blogroll” and “Ministries We Like” sections in the right hand sidebar. One of the neat things we’ve been privileged to observe in our ten years of ministry is the way in which God has been raising up new leaders and ministry organizations to welcome and serve kids with disabilities and their families. In the course of updating our blog, we’d like to call your attention to a few of the individuals and organizations we’ve connected with in the past year doing great work in the disability ministry field. I’ll share three individuals whose links now appear in the sidebar today, and three organizations in tomorrow’s blog post. Gillian Marchenko is a Christian, wife, mother, writer, speaker, and advocate for individuals with special needs. She writes and speaks about parenting kids with Down syndrome, faith, imperfection, and adoption. Her husband serves as pastor at Christian Fellowship Church in Chicago, where Gillian has been involved in launching a respite ministry for families of kids with special needs. Here’s an outstanding post on the importance of mothers seeking help for depression for the sake of their children and family. John Knight is Director of Donor Partnerships at Desiring God. He is married to Dianne and together they parent their four children: Paul, Hannah, Daniel, and Johnny. Paul lives with multiple disabilities including blindness, autism, cognitive impairments and a seizure disorder. John blogs on issues of disability, the Bible, and the church. John is a champion for the value of persons with disabilities within the life of the church, and is busy putting together the Desiring God Disability Conference, to be held this coming November 8th in Minneapolis. Mike Beates is a parent of a 30 year old who lives with profound disabilities related to a chromosomal anomaly. He has served since 2000 on the International Board of Directors at Joni and Friends and is author of Disability and the Gospel (Crossway, 2012). Tomorrow, we’ll introduce you to several ministry organizations you should get to know. Key Ministry is pleased to invite you to check out our new website. Over 180 FREE, downloadable resources are available to pastors, church staff and volunteers seeking to serve kids with disabilities and their families. Please check out keyministry.org today and share the link with anyone who can benefit! This entry was posted in Key Ministry, Resources and tagged blog, Church4EveryChild, Gillian Marchenko, John Knight, Key Ministry, Mike Beates. Bookmark the permalink.